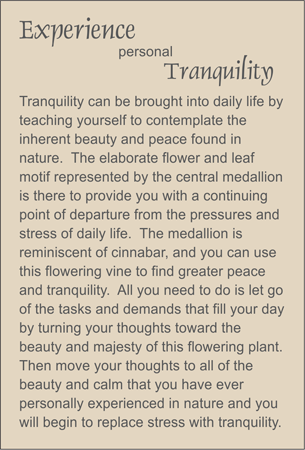 Cinnabar medallion showing a flowering vine as a reminder to turn to nature in order to let go of stress. (Resin over wood, as authentic cinnabar is toxic.) Accented with black agate, replica of an ancient Chinese coin and black tassel. Give this beautiful plant to someone who forgets to water live ones. HOW TO USE: To use, place the coin at the base of the book, iPad or tablet. Insert the double black cords through the pages and drape the cinnabar medallion over the top. Scroll down to see other products featuring Cinnabar.